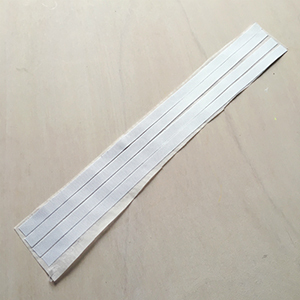 1 pack VELCRO® Brand Stick On For Fabric Tape. 1. Cut one 41x 41cm from the fabric. 2. 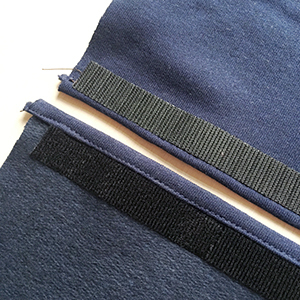 Take the ribbon and cut it into 4 equal lengths, trim each end with a ‘V’ shape. 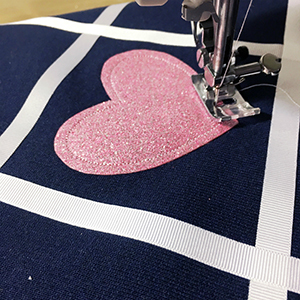 If you are using iron on adhesive iron the ribbon onto a sheet as per the manufactures instructions, then cut out each piece of ribbon and remove the backing. 3. 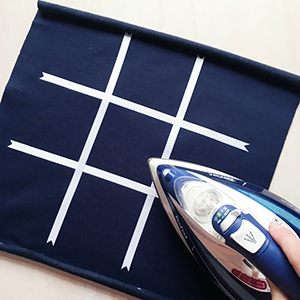 Place the ribbon in the shape of a noughts and crosses board onto the square of fabric and iron in place. Alternatively pin and sew. 4. 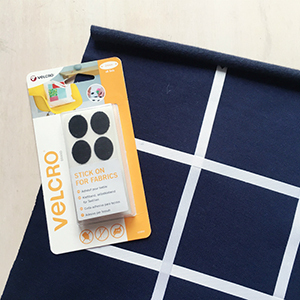 Take the VELCRO® Brand Stick On For Fabric Ovals and stick one half in the middle of each square of the game. Leaving the middle square empty. 5. 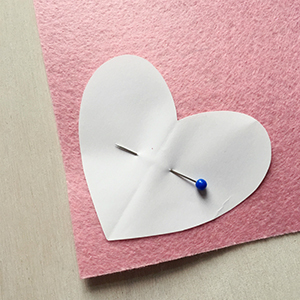 Print and then cut out the heart and kiss templates from paper. Place the template on the reverse of one sheet of glitter felt, draw round and cut out. 6. 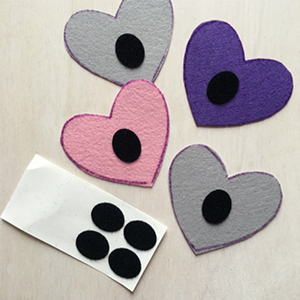 Cut 4 kisses and 5 hearts from the glitter felt. Stick the other half of the Stick On for Fabric onto the back of each kiss and heart apart from one heart. 7. 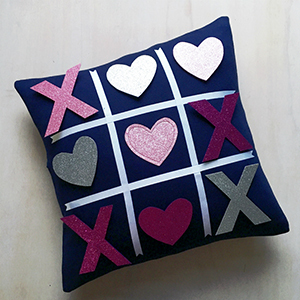 Place this heart into the middle square on the cushion, pin then sew in place. 1. Cut two 41 x 25cm rectangles from the fabric. 2. 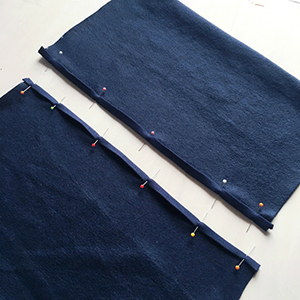 Turn a 1cm double hem on one of the rectangles long side, pin in place and then sew. Repeat with the 2nd rectangle. 3. 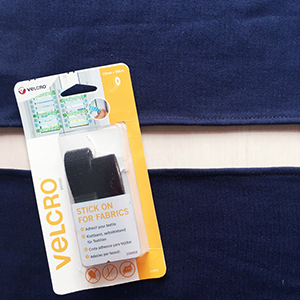 Take the VELCRO® Brand Stick On For Fabrics Tape and cut a 39cm length. 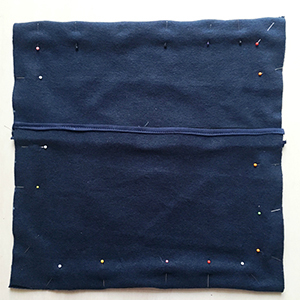 Stick the hook to the reverse of one of the rectangles just below the hem and the loop to the front of the other rectangle just below the stitch line. Then join the strips together making a square. 1. Place the cushion front right side up on a flat surface. Then place the cushion back right side down on top. Pin in place. 2. Sew around the cover 1cm in from the edge. 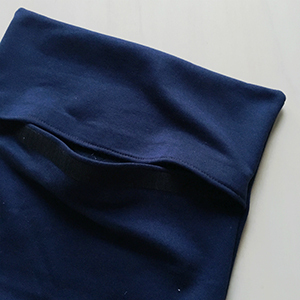 Trim away any excess material then open the VELCRO® Brand fastening and turn the cover right side out. 3. Then insert the pad.